This John Hancock letter was sent while he was serving as president of the Continental Congress to General George Washington in New York. Hancock instructed General Washington to read the enclosed brand new Declaration of Independence to his troops. The Declaration had only been approved two days before. John Hancock sent copies to military and patriot leaders throughout the different colonies. General Washington was in New York at the time. He read the letter to his troops on July 9th. Later that evening, the townspeople pulled down a statue of King George on a horse at Bowling Green. The Congress, for some time past, have had their attention occupied by one of the most interesting and important subjects, that could possibly come before them or any other assembly of men. Although it is not possible to foresee the consequences of human actions, yet it is, nevertheless, a duty we owe ourselves and posterity, in all our public councils, to decide in the best manner we are able, and to leave the event to that Being who controls both causes and events, to bring about his own determinations. Impressed with this sentiment, and at the same time fully convinced that our affairs may take a more favorable turn, the Congress have judged it necessary to dissolve the connection between Great Britain and the American Colonies, and to declare them free and independent States, as you will perceive by the in closed DECLARATION, which I am directed by Congress to transmit to you, and to request you will have it proclaimed at the head of the army in the way you shall think most proper. Agreeably to the request of Congress, the Committee of Safety of this Colony have forwarded to you ten thousand flints, and the Hints at Rhode Island are ordered to be sent to you immediately. 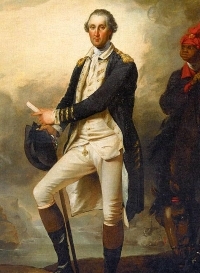 It is with great pleasure I inform you, that the militia of this Colony, of Delaware Government, and Maryland, are, and will be every day in motion, to form the Flying Camp, and that all the militia of this Colony will soon be in the Jerseys, ready to receive such orders as you shall please to give them. I have written to Governor Cooke, to engage immediately, and send forward as fast as possible, fifty ship-carpenters to General Schuyler, for the purpose of building vessels on the Lakes. Fifty have already gone from hence on that business. The Congress having directed the arms, taken on board the Scotch transports, to be sent to you. I have written to the agents in Rhode Island and Massachusetts Bay, to forward them immediately. The inclosed copy of a letter from Mr. Green, I am directed to forward, by Congress, with a request that you will order such parts of the stores, therein mentioned, to New York, as you shall judge proper.